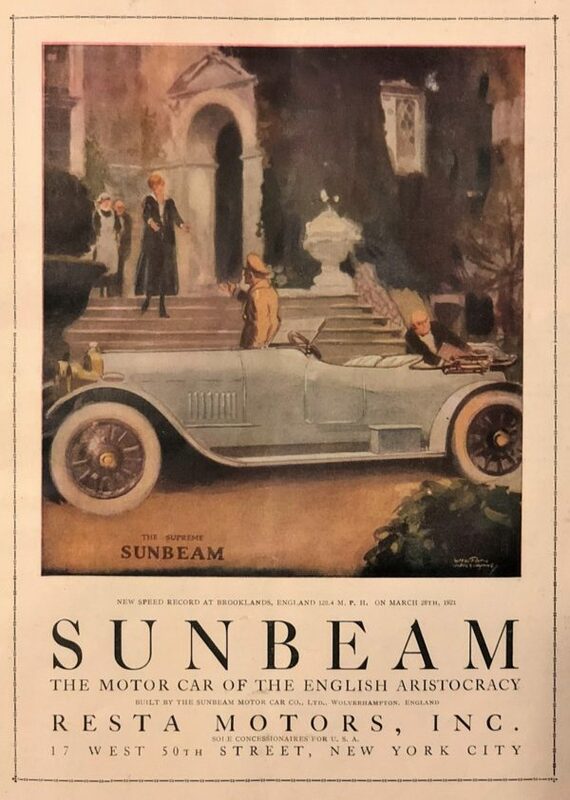 This advertisement for Sunbeam motor cars comes from the ‘Official Program’ of the Ninth International Sweepstakes of the Indianapolis Motor Speedway Company (Distance 500 Miles) dated May 30th 1921. It is remarkable not just for the promotion of Sunbeam cars, but also for the name of the importer – Resta. Dario Resta was at that time one of the most famous racing drivers in the world, with a string of American and European victories to his name. In the list of the Indianapolis races in the 1921 program, we see that Resta placed second in 1915, in a Peugeot, won the shortened (300-mile) race in 1916, again in a Peugeot, and was entered for the 1921 race in a Sunbeam (but apparently did not race). Born in Italy in 1882, Resta moved with his family to England when he was just two years old, and he later took British citizenship. Although we can find no other direct reference in the literature to a motor car dealership or importer run by or named after him, we are told that he worked in the motor industry after leaving school and later opened his own car dealership in London. Resta’s racing career began in 1907 when a client persuaded him to drive his Mercedes in the very first meeting at the new Brooklands circuit in Surrey. He raced for Sunbeam in the French Grand Prix – and was fourth in 1912, sixth in 1913 and fifth in 1914. He travelled to New York on business at the end of 1914 and Peugeot importer Alphonse Kaufman invited him to race in America during the following season. Resta was an immediate success – winning both the 1915 American Grand Prize and Vanderbilt Cup in San Francisco, quite apart from his results at Indianapolis. Resta retired from the sport in 1920 but returned in 1923 and qualified a Packard in third position at Indianapolis. Sadly, he attempted to set a new speed record at Brooklands in September 1924 and crashed fatally after a puncture. We do not know how closely Resta Motors was involved with the man himself – but his competition work for Sunbeam, the import of these highly respected cars into the USA and his specific links to success in the Indianapolis race make it likely that Resta was instrumental in placing this beautiful and elegant advertisement in the ‘Official Program’ for 1921. The theme here is of aristocracy and high society – but Sunbeam did not forget to mention their competition success as well: a new record of 120.4 mph at Brooklands on March 28th 1921. Compelling reasons for the well-heeled spectators at this event to consider a Sunbeam.